Road through Arches National Park. Courtesy Flickr user Ben Grogan. “Moab is a key player in an outdoor recreation economy that in Utah generates $856 million in state and local tax revenue, according to the Outdoor Industry Association. Well more than 70 percent of the jobs in Grand County — 2,440 as of 2012 — derive from tourism. More energy development is anticipated in the area, which contains an estimated 145 billion cubic feet of natural gas and 32.5 million barrels of oil. Fidelity Exploration & Production Co. operates 17 wells near Dead Horse State Park and Canyonlands National Park, reports the Deseret News, and plans at least a dozen more. The BLM expects at least 100 additional wells from other companies over the next 15 years. 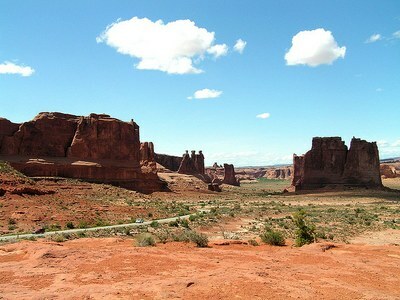 Along the road to Dead Horse Point. Courtesy Bill Rau. Fidelity is also building a controversial 24-mile-long pipeline to capture natural gas being flared from its wells. Last month, Moab citizens held a protest in front of the BLM office to encourage the agency to improve the safety of the Fidelity pipeline, which runs near campgrounds at Canyonlands and Dead Horse. They’ve also been worried about the company’s water consumption: Although Fidelity’s wells bring $2.6 million in revenue for Grand County each year, they’ve used millions of gallons of potable water, a crucial resource in this desert area. Companies are lining up to extract other Moab-area resources, too. The recent jump in potash prices, from $200 to $900 ton, has created a surge of interest in mining potash in the area. And other companies are eyeing eastern Utah’s tar sands and oil shale. Meanwhile, competing visions for the future of the Moab area abound. Rep. Rob Bishop, R-Utah, is floating his own legislative plan, the “Grand Bargain” (see our story “New Route to End Utah’s Wilderness Stalemate”), which sets aside some wilderness and also carves out land for mining and drilling. Grand County is working on a set of proposals for land use; one of its three alternatives will eventually become part of Bishop’s bill. Local conservationists say the county’s alternatives strongly favor drilling, mining and off-road vehicle use, and ignore the fact that nearly 90 percent of public comments support wilderness and public lands protection. "When the current council was seated, we took a vote and said we were opposed to the monument," Grand County Council Chairman Lynn Jackson said. "We know we live in an iconic landscape, but a unilateral decision made by a small group of people is not the way we believe things should be done." Looking toward the La Sals. Courtesy Bill Rau. “A master leasing plan … allow(s) officials to closely coordinate leasing and development in an area with special resource conflicts. And it allows the BLM to add extra layers of rules to protect wildlife, waterways and other potentially vulnerable resources before a lease auction ever happens. The BLM’s environmental analysis efforts have ticked off the energy and potash industries, though, because it’s deferring further leasing until the MLP is complete. The first draft of the Moab-area environmental impact statement should be out this fall. Meanwhile, budget problems at the BLM mean that it’s indefinitely postponed work on four other MLPs in Utah, including the Book Cliffs and Vernal areas. Recognizing our own involvement in energy extraction is, of course, essential to any thoughtful consideration of the issue. As Jim and so many others have noted, it’s nothing but hypocrisy to drive to a trailhead, heat your home, run your clothes dryer, etc. while decrying fossil fuel production. The production of fossil fuels does not require that industry be given license to always use the least cost methods, that environmental values be devalued and subordinated to company demands, and that oil and gas resources lands be allowed to become sacrifice zones. Jodi Peterson is the managing editor of High Country News.